If you recall from a previous post a few months ago, Whit and I were trying to narrow down a vacation spot. There was one place that wasn’t in my blog post, but always in the back of my mind. After much discussion, research, reading reviews and searching google images, we finally made a decision. We are going to Thailand and I couldn’t be more excited! It’s been on my list of places I would like to visit and it’s still hard to believe that we are actually making it happen. I’m welcoming any and all travel tips. Advice about long flights, traveling to foreign countries, must have apps, things I should pack, etc, I want to be as prepared as I can for this exciting journey! Um, amazing! I've heard such fantastic things and am sure you'll have incredible photos (and food experiences) to share. 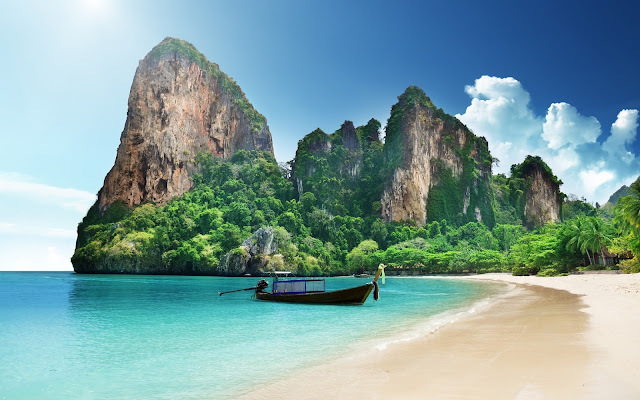 Thailand looks gorgeous, bet it will be a great trip! SO exciting!! I’ve always wanted to go to Thailand! Y’all are going to have the best time! Thanks! It's been on my list for a long time. I'm so excited to finally say I'm going. I don't really know anything about Thailand, but I love using Pinterest as a travel planning tool, I've found it more helpful than google searching personally. That is going to be such an adventure! Yes, good idea. I'm sure I can find a lot of good tips and info on Pinterest.